For me, cooking for others is all about the joy of shared experience. It’s family sitting round a big kitchen table and breaking bread, friends catching up over long boozy dinners, the look on people’s faces when you emerge from the kitchen – whether carrying an incredible confection or a simple supper – and the satisfaction of introducing your loved ones to favourite recipes or brand new flavours. Cooking for others can also be tricky; there are different tastes to consider, different appetites to allow for, and in some cases, diet restrictions to bear in mind. Heading round my parents for dinner recently, I knew I wanted to make something using the ice cream maker they’d given me for my birthday, but was confronted by a few constraints. My Dad, as per your (larger than) average middle-aged man, is on a semi-permanent diet to keep his heart in healthy shape, and my Mum doesn’t have a hugely sweet tooth. Luckily I’ve not yet inherited either of these troublesome traits, but I wanted to create an ice cream (or two) which they would both enjoy. After a few hours trawling through recipe books and tinkering with ingredients, these two flavours are the result. First up is an incredible chocolate sorbet. If you love chocolate and you’ve never tried chocolate sorbet, you honestly haven’t lived. This sorbet is so lusciously rich, so beautifully creamy, and so intensely chocolaty, you’ll wonder why you ever bothered to dilute your chocolate fix with such frivolous additions as milk and cream. I initially hit on the recipe as a lighter way for my Dad to enjoy chocolate without lashings of artery clogging dairy products – a kind of ‘square-of-dark-chocolate-a-day does you good’ principle – but can honestly say it’s so much more than that. Before freezing, the mixture is a thick, glossy chocolate soup. After, it churns into an ice so smooth and complex you’d be hard pushed to guess it was a sorbet. I’m not sure you’d get the same texture if you froze it by hand, but if ever there was a reason to invest in an ice cream maker, this is it. My second flavour was more of an experiment. I wanted a custard-based ice cream to complement the sorbet, but was hoping to keep it light, fresh and not too sweet. 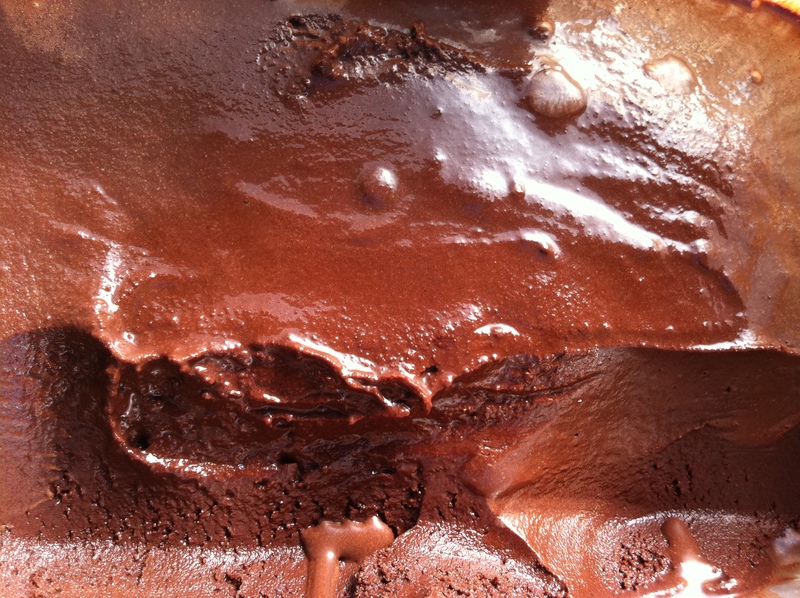 This ice cream also needed a little texture or crunch to contrast with the smooth silkiness of the chocolate. When I was little, my Mum used to make us wholesome flapjacks with tahini and sesame seeds, replacing some of the copious quantities of sugar with a little honey. I’d made peanut butter ice cream before, so why not use tahini? I stirred a few dollops into a custard base, adding just a touch of unrefined golden caster sugar, then crumbled in a simple sesame brittle made of toasted seeds and honey. I was a little worried that the abstemious sugar quantities combined with the almost savoury sesame might result in an inedible ice cream, but it was delicious. The ice cream is rounded and nutty with a satisfying sesame crunch, little pockets of seeds and honey crisp against rich, smooth cream. So there you have it; two fabulous new flavours to add to my ever growing list of frozen favourites. My parents absolutely loved them both, in fact my Dad even went in for seconds on the sorbet. Not strictly ‘on-diet’, but then everyone needs a little indulgence once in a while . . .
Whisk together 375ml of the water with the sugar, cocoa powder and salt in a large saucepan. Bring to the boil, whisking frequently, then let it boil, continuing to whisk, for 45 seconds. Remove from the heat and stir in the chocolate until melted, then stir in the vanilla extract and remaining 180ml water. Transfer the mixture to a blender and blend for 15 seconds. Chill thoroughly then freeze in your ice cream maker. Preheat the oven to 175 degrees C. Line a baking trail with tin foil. In a frying pan, warm the honey. Remove from the heat, stir in the sesame seeds until evenly coated then spread the mixture on the tray and bake for 25 mins. Remove from the oven and let cool completely. n.b. the brittle goes a little soft if left to long, so use within an hour of cooling. Place the milk in a saucepan and bring to boil. Remove from the heat, add the tahini, then cover and let steep for at about an hour. After an hour, strain the mixture, pushing through as much tahini flavour as possible. In one large bowl, whisk the egg yolks and sugar. Pour the cream into another large bowl and set it on ice. Rewarm the milk mixture and pour onto the yolk, constantly whisking, until incorporated. Place this mixture in a clean saucepan and put on a medium heat, constantly stirring until the custard thickens and coats the back of your spoon. Pour the custard over the chilled cream, stirring until cool, then chill in the fridge. Churn in an ice-cream machine according to the manufacturer’s instructions. While the ice cream is still soft, spoon into a container, crumbling in your honey sesame brittle until well incorporated, leaving nice chunks here and there. I really need to get an ice cream maker – both these flavours look amazing and I love the idea of a chocolate sorbet. You had me at honey sesame brittle ice cream – wow! Sounds delicious – am getting ice cream maker out straight away! I love chocolate ice cream..and live off mango sorbet, but never have had choccy sorbet! This sound like my idea of heaven!! And that honey ice cream gives it a run for its money also, goodness me two unique and gorgeous recipes, i need to get myself a goddarn ice cream maker! Such an interesting combination! Looks fabulous and that honey sesame brittle ice cream sounds delicious!! My goodness, the chocolate sorbet looks incredible! Its really interesting to hear how you were inspired by your mums flapjacks with tahini for the ice cream, which also sounds amazing. 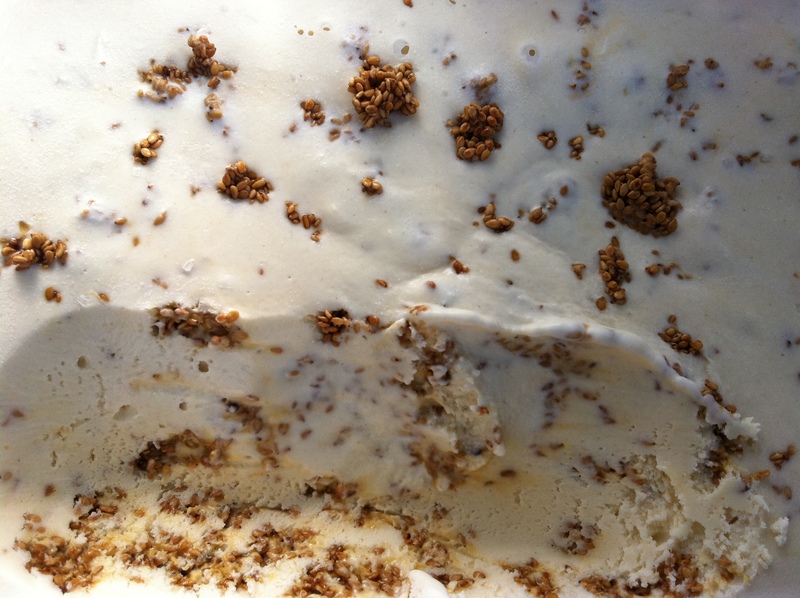 i’ve also made honey sesame brittle ice cream before and it turned out great! yours looks wonderful as well! and the chocolate sorbet, yum yum! Sounds divine! One of my favourite ice-creams ever was surprisingly not in Italy but a black sesame ice-cream in Tokyo – mmmm! London Bakes – an ice cream maker makes SO much difference, I promise it’s worth the investment. I got mine as a birthday present – it has two bowls so I was able to make both flavours at once, magic! Yasmeen – the tahini makes the ice cream really round and rich. If you use it lots, I’d definitely recommend trying that flapjack recipe too, it’s delicious. The Procrastobaker – I’m never going to say I’d give up chocolate ice cream – it’s one of life’s ultimate pleasures – but for an intense chocolaty hit, the sorbet has to be tried to be believed! With Milk & Flour – a lot of my inspiration seems to come from things I had when I was little. I guess the flavours stay with you, and dessert making is so much about comfort that part of you wants to replicate those childhood memories. Fleur du Poirier – it’s a great flavour, will definitely be making again. Greedy Diva – I found a lot of black sesame recipes when looking for inspiration for my white one online…they looked seriously good. Will need to give it a try soon! We got my husband an ice cream maker last year but seem to mostly use it for making sorbets. I can’t believe how easy it is to make sorbets and they taste like it is something so complicated! 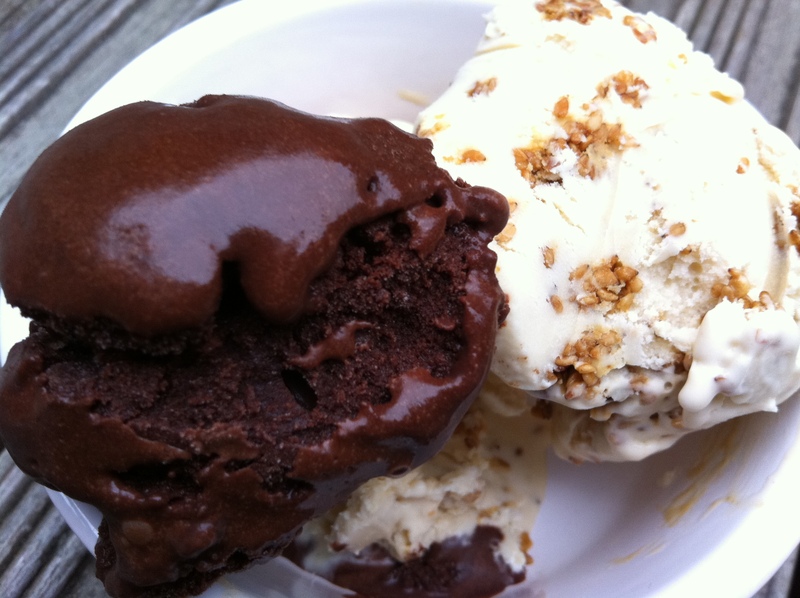 Oh that chocolate sorbet looks heavenly! Amazing flavour combinations. 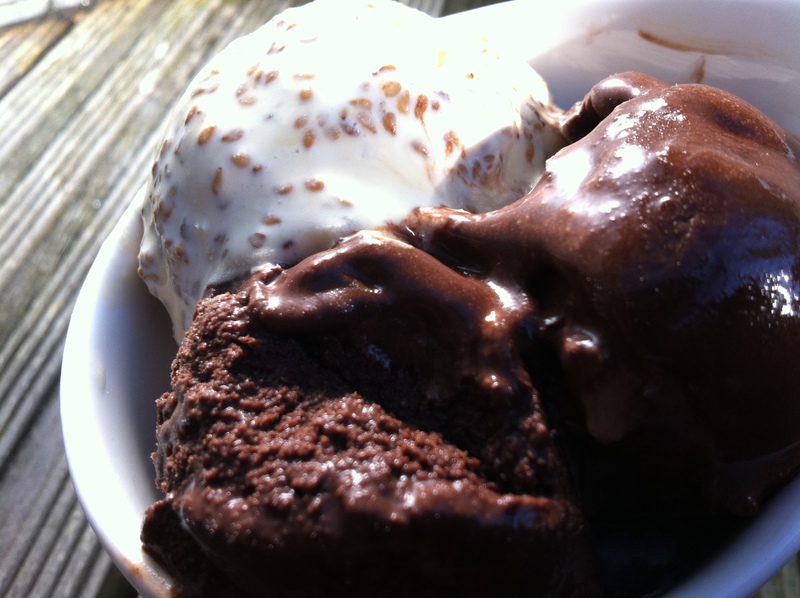 I so need to try that chocolate sorbet – looks so, so good! Snippets of Thyme – I love ice cream, but after the success of this chocolate sorbet I definitely want to try some fruit flavoured sorbets. Fabulicious Food – thank you! Frugal Feeding – you definitely should! Why wait til summer? 🙂 The place you worked with honey ice cream sounds awesome…shame it’s no longer going. That honey sesame brittle ice cream sounds divine, I must try that.